Are Papitese Dogs the Right Maltese Mix for You? They are one of the rarest Maltese mixes, but are becoming more popular because of their strong loyalty and affectionate personality. 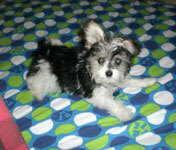 Read more about the Papillon Maltese below to see if this is the right Maltese mix for you. Do you have a Papitese? Tell us more about his/her personality & your dog could be famous! 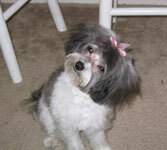 A Papillon Maltese mix takes on the temperament of both Papillons and Maltese. They are gentle, responsive, and very sociable little dogs. Papitese are also highly intelligent and easy to obedience train. Be sensitive while training though, because harsh words can easily upset them. They love to be around people, dogs, cats and any other pets. They are alert watch dogs, but welcoming to most strangers. Most people find Papitese puppies to have a cheerful, affectionate, and loyal personality. If you already have a Maltese Papillon dog or know someone that does, check out these unique gifts for dog lovers below. These Maltese Papillon dogs come in almost any color, including cream, gold, white, silver, blue, and black. Most are parti (two colors) or tricolor (three colors). Hair is usually wavy, soft, and double-coated; with both an outer and undercoat. They may also be nonshedding like a Maltese or shed very lightly like a Papillon. Although some do shed, they are almost always hypo allergenic. Full grown Papillon Maltese average 9-12 lbs, about 3-4 lbs larger than a purebred Maltese. Do you have a Papitese? If so, your Maltese mix could be famous! Please tell us all about your dog and we'll put it on our website. What kind of personality does s(he) have? What makes him/her so special? Let other Maltese Maniacs know what to expect from a Papitese. Submissions must include at least 200 words of text and a picture to be accepted. Thanks!